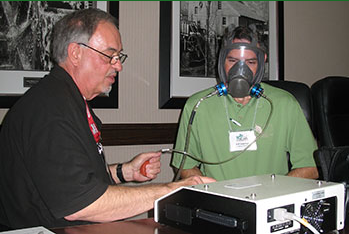 The fit test determines if the respirator forms a complete seal with the person’s face. 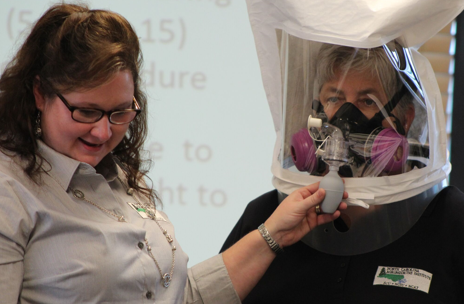 It must be performed with the same make, model, style and size of the respirator that will be used when handling pesticides. The person conducting the fit test must have completed the appropriate respiratory protection training. Additionally, for qualitative fit tests, the person administering the test must be able to prepare test solutions, calibrate equipment and perform tests properly, recognize invalid tests, and ensure that test equipment is in proper working order. OSHA does not offer a training or issue a physical card or certificate indicating a person is qualified to conduct this type of test. Although they are not required by OSHA, there are a number of training opportunities to obtain a fit testing certificate. Click here for full explanation of OSHA approved fit testing options. The qualitative test is pass/fail and relies on the employee’s sense of taste and smell to detect a substance introduced into an enclosure (video example found here: https://youtu.be/5p28dC5CB8Q). This type is designed primarily for half-face respirators. The quantitative test uses a machine to measure the actual amount of leakage and does not rely on your senses to detect a leak. This type is designed for any type of tight-fitting respirator, and is usually conducted at occupational clinics. Fit tests must be conducted annually and for each type of respirator you plan to wear, including particulate-filtering face masks. If any drastic changes in physical appearance occur within the year that cause the seal to become compromised, an additional fit test must be done. Loose fitting respirators (e.g., helmets, hoods) do not require fit testing but do require medical clearance. Keep records for two years. Click here for an example of an individual fit test record form. To record members of a group, use this form.